What Makes a Superior Chile and Vegetable Roaster? • The Az Sonoran Chile Roaster has functionality and design. The wide base gives stability. Others look lik e they can tip easy. The scrolls not only look nice but also give stability and strength to the uprights which the basket is mounted and rotates. 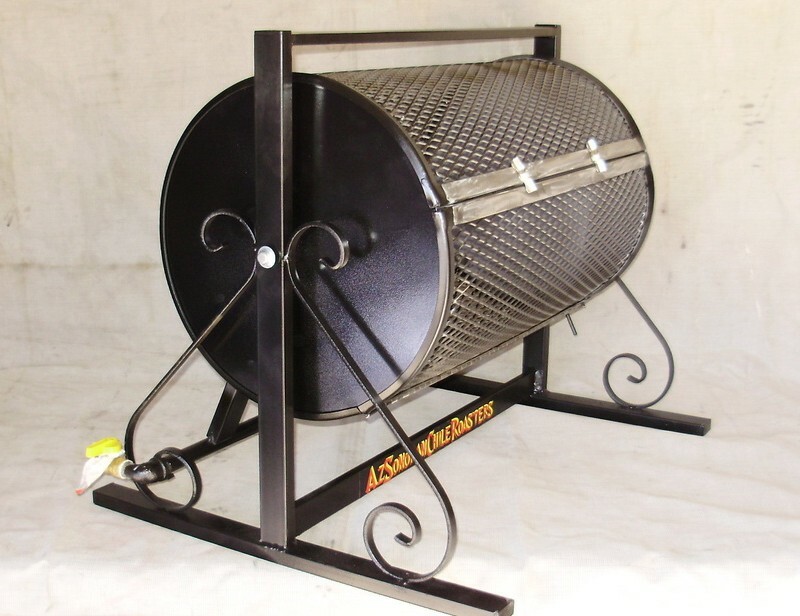 • Our custom designed basket also makes the Az Sonoran Chile roaster a superior product. Our design offers an angle ring with hidden welds to hold the end caps, instead of flat stock roll into a circle and with visible welds around the perimeter. • The #13X ½” expanded metal is attached with virtually no visible welds. This whole assembled basket turns on our special made axle bushings and axles which now eliminates the axle going through the center of the basket which now gives the user a non-intrusive, unobstructed roasting experience. • This modification makes the loading and unloading easier, increases capacity by allowing your chiles or vegetables to tumble freely in the basket. By style, function and design no others can compare. This superior patent pending design turns on oiled bronze bearings, no metal on metal here. • Our full length doors also offer superior access to your roasted chiles and vegetables. All the baskets are counterbalanced for a smooth operation especially in the motorized version. Last but not least are the burners. They burn clean propane with the blue part of the flame contacting the food for that superior roasting experience. Az Sonoran Chile Roasters LLC. All Right Reserved. Patent Pending.